If you've got less than two grand to spend, where should you be putting your money? And what can you expect for it? Below £2,000 there's a wide range of electric mountain bikes available, and the higher your spend the more you're likely to be getting your hands on a properly trail-ready machine. There are mountain bikes and mountain bikes. As with non-powered bikes, you can spend a little or a lot, and that decision will be down to your budget, and what you want the bike to do. The more technical the riding you're going to be doing, the more you'll be looking at a larger outlay. electric mountain bike prices go right up into five figures, but you don't need to spend that to get a properly trail-capable bike. Hub motors are pretty capable and cheap these days. If you're looking at the lower end of this price range then that's what you'll get, either in the front hub or (more likely) the rear. Up nearer £2,000 you can get a bike specced with a mid motor instead. For mountain biking, this is better for a number of reasons. The first benefit is weight distribution. A mid-motor e-MTB has all the weight in the middle and that means more predictable handling on more technical terrain. If your bike has a rear hub motor and it's a hardtail bike, the motor weight is concentrated at the centre of the wheel, so if you hit a rock you'll be exerting larger forces on the wheel and rear triangle relative to a mid motor design. If it's a full suspension bike then you have more sprung mass with a hub motor, which will negatively affect the suspension response to changes in terrain. The same is true of a front hub motor in a suspension fork, with the added problem that the heavy motor will increase fork flex, meaning steering isn't as precise. For all those reasons, if you're looking to do any proper off-road riding over technical terrain, you're better off with a mid motor bike. There's lots of people who might be looking at an e-MTB that aren't planning any white-knuckle stuff, and there's plenty of bikes out there that will be fine for light off-roading at prices well south of the £2,000 mark. It's worth noting that if you're looking at mountain bikes and the toughest terrain you're going to be pointing them at is towpaths and fire roads, then there's plenty of hybrid bikes that can easily cope, and you may get more for your money going down that route. All e-MTBs will come with a suspension fork of one sort or another. Hardtail bikes have no suspension at the back, and usually have a fairly standard diamond frame. Full suspension bikes will have some sort of linkage to allow the rear wheel to move, and a shock unit to control the suspension. Full suspension adds weight and complexity and the quality of the shock you're going to get for this money will mean the increase in ride quality is unlikely to be huge. Most of the bikes below £2,000 are hardtail designs. Rear suspension tends to be on more expensive bikes, though some under £2k use it. This linkage is from a £3,799 Cube Stereo Hybrid. You'll be getting derailleur gears from Shimano, or SRAM, and disc brakes too. Hydraulic brakes (where the bake is actuated by hydraulic fluid in a hose) are better than mechanical brakes (where a cable is used to pull the brake). The suspension fork will be by probably be made by Rock Shox or SR Suntour if you're nearer the £2,000 mark, and by Suntour (a lower spec model) or Zoom for lower budget bikes; it may also be branded the same as the bike. Currently there are three wheel sizes for mountain bikes. 26-inch is the original size and used for most budget bikes, with the newer 27.5-inch and 29-inch sizes more common on higher-end trail bikes. There are also plus-sized systems, which use a wider rim and a bigger tyre. They're good for e-MTBs because they give more grip and a bigger air chamber in the tyre to soak up bumps from rocks and roots. Let's have a look at some of the options, starting at the lower end and moving up to the £2,000 mark. At £895 the Eiger is about as cheap as e-MTBs get, and for the money it gets a decent spec. The frame is a one-size alloy hardtail design and you get an SR Suntour suspension fork up front. There's a TCM crank motor with a 374Wh down tube battery, and the bike has 9-speed Shimano gears and and Tektro Auriga hydraulicdisc brakes. An optional Plus Pack (£35.40) adds a kickstand, mudguards and lights, and for an extra £466 you can have the remarkable NuVinci automatic rear hub as shown above. The RooDog Striker gets a hardtail alloy frame with a Zoom suspension fork. The 250W motor is in the rear wheel and there's five levels of assistance available from the bar-mounted display which also operates the integrated lighting. RooDog reckon the 360Wh battery is good for 30 miles of off-roading. You get a 7-speed Shimano Tourney transmission and 26-inch wheels with Kenda tyres. Oxygen's S-Cross has a semi-integrated battery; 374Wh is the standard although a 468Wh option is available for an extra £50, definitely worth the spend. Hydraulic disc brakes from Tektro, a Shimano Altus drivetrain, 27.5-inch wheels and a SR Suntour XCM fork mark this out as a bike designed for more than just the towpath. There are six assistance levels available from the 250W rear hub motor. Gtech's urban bike is just under £1,000 but they've decided to go for a higher price point for their e-MTB. (The price above is a special offer from Cycle Republic; it's usually £1,896). It's specced for proper off-roading; you still get a hub motor but Gtech have sensibly specced a parallelogram suspension seatpost to stop the weight of the rear wheel working so much against the rider's weight when it hits a bump. Up front there's a Rock Shox fork, and you get Shimano Deore gears and hydraulic disc brakes. Gtech don't say how big the battery is on their website but judging by the 30-mile stated range we're guessing it's around 360Wh. The Delta is Batribike's new hardtail, built around an alloy frame and 29-inch wheels. The battery is integrated into the down tube to help keep the weight low and central. It's 374Wh as standard but other options are available. The bike uses a rear hub motor with four power levels, and the drivetrain is 27-speed Shimano Acera with hydraulic disc brakes from Shimano too. 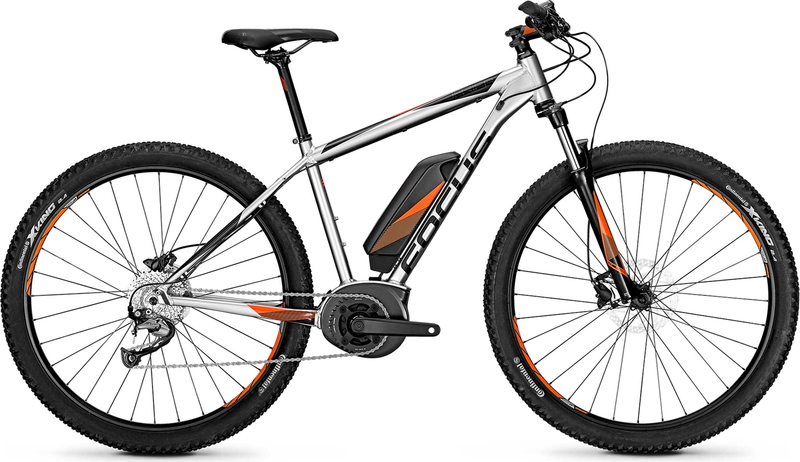 The cheapest of Focus' Jarifa2 range nevertheless has a Bosch Active Plus mid-motor with 400Wh battery and SR Suntour XCM RL suspension fork, wide-range gears with a Shimano Deore XT derailleur and hydraulic disc brakes with off-road-friendly 180mm rotors. This is about the minimum you'll pay for a mid motor bike, but the Cube gets an impressive spec for the money. For a start you get the top-spec Bosch Performance Line CX motor, mated with a 400Wh battery. There's 10 speeds on tap from the Shimano Deore gearing and stopping courtesy of Shimano hydraulic discs with off-road-friendly 180mm rotors. The SR Suntour XCR fork has a remote lockout on the handlebars. Wheels are 27.5-inch in the smaller frame sizes, and 29-inch for the larger ones. If you're a lady looking for a trail-capable mountain bike under £2,000 then the Powerfly 5 has a solid spec, including a Bosch Performance Line mid motor and 400Wh battery pack. The women-specific alloy frame is mated with an SR Suntour XCR fork and Shimano Altus 9-speed transmission and hydraulic disc brakes. The 2018 version is out of our budget here, but there are still 2017 models in shops at very good prices.